Pacific Northwest couples at odds are figuring out how to keep the peace ahead of Tuesday's midterms. Chuck and Donna Grall have quietly voted for different candidates since they married in the 1980s. Chuck is the staunch Republican, Donna is the die-hard Democrat. The Sequim husband and wife both believe in God and help with animal rescues, and she’s always supported his hobby of playing music at different venues around town. Then Donald Trump appeared on their television screen. “When Trump ran for president I said, ‘Oh my gosh, this is going to be hell around here,’” Chuck Grall, 77, said. 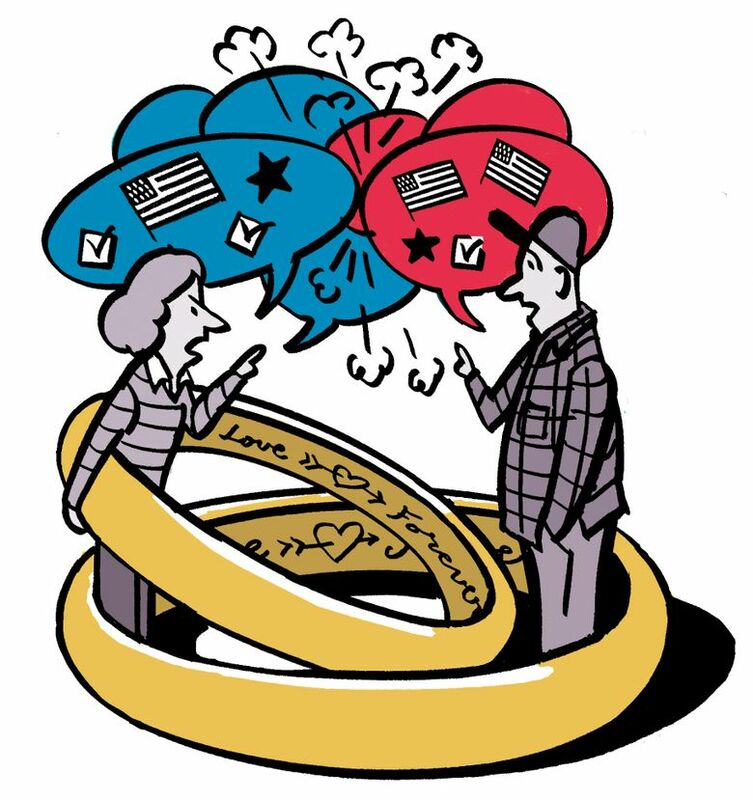 Like swaths of couples nationally, politics has caused tension within their relationship. Within those inter-political couples, the tension has been amplified following the election of Trump, as the nation appears to become more politically polarized. Most married couples across the nation — about 70 percent of them, according to a 2016 data analysis of 18 million couples — report the same political affiliation. But the remainder have differing leanings. And leading up to Tuesday’s midterm elections, Seattle Times readers reported their own houses divided. An Issaquah couple married for 21 years has deemed all political discussions in their house taboo “for the sake of our marriage.” A husband and wife in Kirkland mute all political ads when they watch “Jeopardy!” together. A long-term boyfriend and girlfriend in Seattle in their 20s nag the other about how they’ll cancel out each other’s votes. According to a 2017 survey conducted by Wakefield Research, about a fifth of all Americans know a couple whose marriage or relationship has been negatively impacted by the 2016 election. Another survey by the research company found that about one in 10 people have ended their relationship because of political differences. Grall said he avoids mentioning Trump in front of his wife, but she’ll often say to him, “Did you hear what Trump did today?” For his part, Grall acknowledges that Trump isn’t tactful, and disagrees with his policies related to families separated at the Mexican border, but thinks he’s done a good job with the economy. “I don’t think he has a sympathetic heart, but what can you do?” Grall said. His wife will hear none of it. “There are so many things we can’t talk about: taxes, law enforcement, guns. That’s a real shame because I think sometimes we just don’t talk when most couples would be talking,” she said. A person’s political views today also reflect their values and worldview, said Neil Malhotra, a Stanford Graduate School of Business political economy professor who has studied the intersections of dating and politics. In the past, that was less likely to be the case. “By ‘worldview,’ they’re not really disagreeing that the top marginal tax rate should be 39 percent versus 35 percent, but rather they’re disagreeing about fundamental issues like the identity of our country and immigration and women’s rights,” he said. In some couples, the tension doesn’t stem from who they voted for, but the act of voting itself. Chris Thomas doesn’t think she would have ever met her long-term partner, Tom Verdos, if not for her involvement in politics. She was dropping off a packet of mailers to a fellow board member for an organization that helped recruit and train progressive women to run for office in Idaho. There he was, talking with the board member outside their houses. That was more than 17 years ago. They’ve been together since. But as the relationship progressed, Thomas, a 62-year-old longtime Democrat, discovered a problem: The man she loves doesn’t vote. Verdos, 56, grew up in a religion whose members don’t vote as a way to stay politically neutral. Among nonregistered voters in the United States, 14 percent said one of the reasons they hadn’t registered was because their religion discouraged them from casting a ballot, according to the Pew Research Center. He left the religion, he said, and would label his political affiliation as an independent. But he still wants to remain neutral, even though Thomas jokes that his registering to vote would be better than a marriage proposal. Come Tuesday, the couples will be hoping for opposite results when the numbers come in. But they’ll breathe a sigh of relief that they’ll no longer have to mute any political ads.